If you are cooking for someone on a specialised diet (for example you are cooking for a diabetic) or perhaps you just like to be precise about your recipes, you need a sensitive kitchen scale that can weigh very small amounts precisely, so that you can control exactly what is going into your meals. The best sensitive scales are digital, and this pages lists the best examples on the market. They’ve nicknamed this scale “The Edge” because of how thin it is – just half an inch thick. It is made of stainless-steel which is easy to keep clean, and has an 11 pound capacity (about 5000 grams). It can weigh food as small as 1 gram (0.1 ounces), and can switch easily from pounds and ounces to grams as well as fluid ounces and milliliters. It is powered by a long-life lithium battery which is included, and comes with a 10 year warranty. This scale measures as low as 1 gram (0.1 oz) and has a capacity of 33 pounds (15kg). The surface is made of tempered glass (easy to clean). The weighing surface is particularly large (10.35 inches by 7.87 inches), and in addition has a “hold function” which you can press if what you weighing covers the read-out screen – the reading will stay for 10 seconds after you have lifted the item from the scale, so you can note it. Get this scale if you need a big weighing surface or need to weigh heavy items. It comes with a 5 year warranty and is powered by two AAA batteries (which are included). Soehnle are a German company, but the scale is made in China. The surface of this scale is black tempered glass (said to be four times as strong as normal glass). It is easy to wipe clean too. The LCD display shows weights in pounds and ounces, grams and kilograms as well as fluid ounces and milliliters. It has a capacity of 11 pounds (5250 grams) and can weigh food as small as 0.1 ounce (1 gram). It also has a tare feature so you can subtract the weight of the bowl. It is powered by two lithium batteries (included) and switches off after 1 minute of non-use. 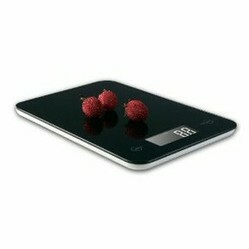 My recommendation: If you need a sensitive kitchen scale with a very large capacity, choose the Soehnle Page Profi. If you need something smaller, both the American Weigh and the Ozeri Touch will do the job well – choose depending on whether you prefer a stainless steel surface or a glass surface.